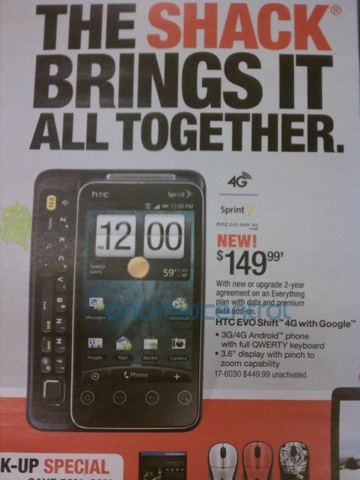 The successor to the Sprint HTC EVO will be released on January 9th, according to a leaked Radio Shack sales flyer. The EVO Shift 4G adds a full QWERTY keyboard to the EVO, making it easier to enter text. The phone will be released available on January 9th for $149.99 with a two year contract. So who is going to be running to The Shack on the 9th to pick up one of these 4G phones?